Figure 1: Label side of 12 VDC power supply commonly included with Swann surveillance/security systems. 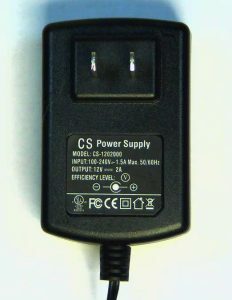 Figure 2: Back side of 12 VDC power supply. figure 1 and figure 2), BEWARE! These power supplies are almost 100% guaranteed to fail. To make matters worse, before they fail completely they are very likely to cause damage to one or more of your cameras (which run around $45 or so each to replace) and — worst of all — they can damage your DVR/control unit beyond feasible repair. 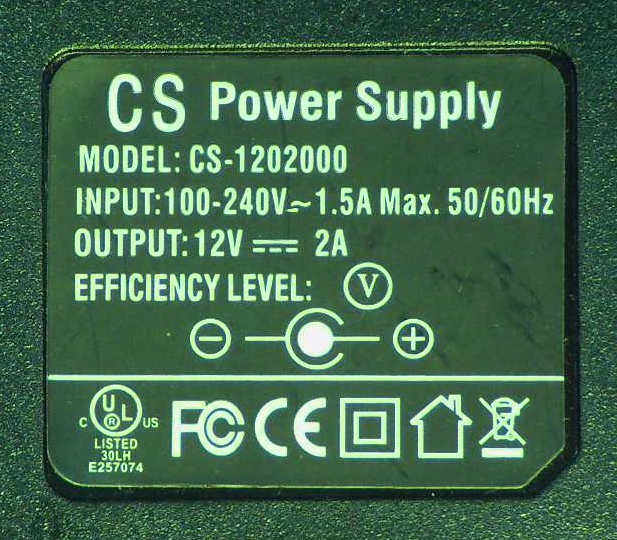 These power supplies do not hold up to anywhere near the load rating shown on the label. 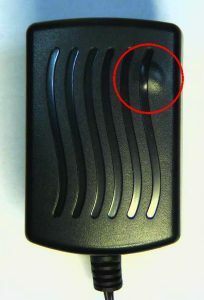 Figure 4: Heat inside the power supply slowly melts the plastic case, forming a bulged spot. thing is running even hotter on the inside. 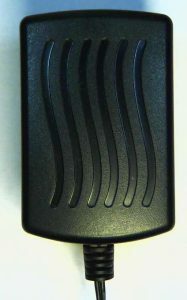 The first thing that often happens is one or more cameras stop working altogether, or they start acting weird, getting grainy, discolored images, stop working at night (the infrared LED circuitry inside the camera burns out), or — in the worst-case scenario — the main control/DVR unit gets fried. By that time, if you take another look at your power supplies, you’re very likely to discover that one or more of them has developed a little “bulge” in the upper right-hand corner of the back side, as seen in figure 4. If you have one of these systems in operation and one of your power supplies is already looking like this you need to REPLACE IT IMMEDIATELY. If you don’t, it will soon get worse. That bulged area will enlarge (as seen in figure 5) and the risk of damage to your equipment rises exponentially. I’m sort of surprised I haven’t seen one literally catch on fire. I recommend you don’t purchase the identical type and model power supply because you are still going to be going down the same road. In fact, these surveillance systems are priced modestly enough (but actually have great features) that the wise thing to do is don’t install the Swann power supplies to begin with. I’m sure Swann might argue that using anything other than their power supplies voids the warranty, trust me: I’ve dealt with trying to send one of their cameras in for warranty repair/replacement and it was such a hassle that I opted to buy a replacement camera and tossed the bad one in the trash can. I figured that instead of paying the shipping and such to send the bad camera to Swann and then waiting around for it get back to me (or a replacement to come in) it would be way less expensive and frustrating to just buy a new camera on Amazon and get the free two-day shipping to help keep my cost and workload down. What is the actual cause of the overheating, bulging, and burn-out problem? 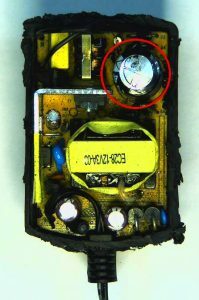 Figure 6: the culprit, an electrolytic capacitor. Figure 7: Closer view of the notorious little troublemaking capacitor. 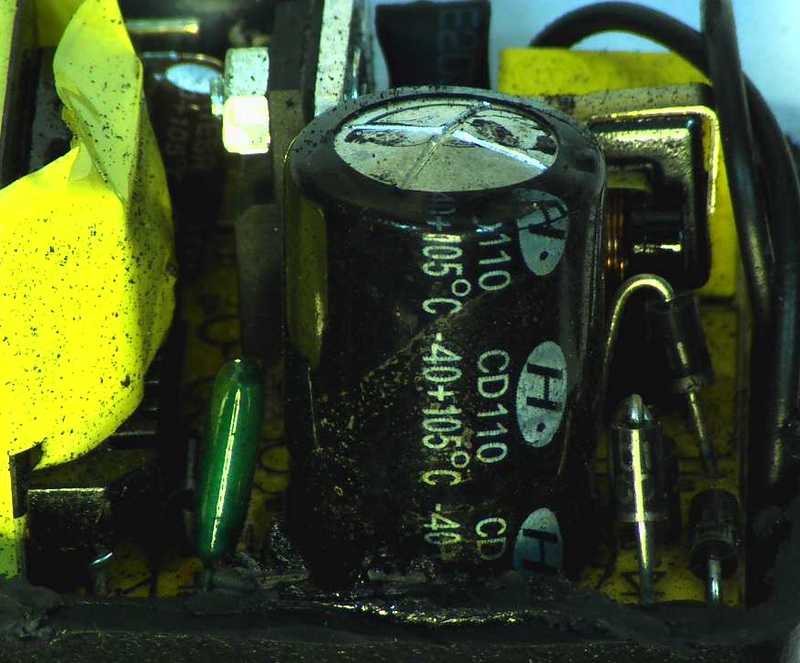 flaps of the capacitor have bulged upward, indicating it has overheated and failed. 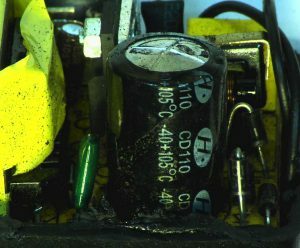 You can also see where there’s electrolyte on the sides of the capacitor, which has leaked out as a result of the blowout. This is a 22 uF, 400V, 105 degree capacitor according to the label on it. Given their regular habit of biting the dust, it’s apparent that either the circuit is improperly designed and there’s too much current being drawn from the capacitor, causing it to overheat, or perhaps the manufacturer of these power supplies purchased about a gazillion bad capacitors from some overseas manufacturer (OMG… is that possible… oh, yeah, all those blown HP and Compaq laptop motherboards in the last few years says it is more than just “possible.”) When this cap blows, the AC ripple shoots up (thus making its way to the cameras and/or control unit) and DC regulation becomes merely a cool idea that ain’t happening. I’ve pondered whether or not a different value capacitor might prevent this problem, but given the relatively low cost of decent DC power supplies of higher quality (plus the savings of time and effort it would take to saw every case open, get the board out, and even try to replace these stupid things) I’d rather spend $20 or so and employ another tactic which works wonders. Read on! Figure 8: The only useful part of these crappy wall-warts (in my opinion) is the cord and plug that’s on the other end. 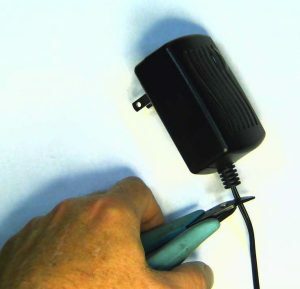 Cut the cord off of the wall-warts, strip the wires, put whatever connectors you need to on them (spade lugs, PowerPoles, whatever) and get yourself an inexpensive but decent quality 12 VDC power supply rated at about 3 to 5 amps. Seriously, they’re pretty inexpensive on Amazon and eBay — and much cheaper than replacing your cameras, control box/DVR, or the whole system. If you’re really electronically inclined and have an oscilloscope, look at the output of the power supply you intend to use and make sure its output has very, very little ripple. Even better: hook a good 3 amp or so resistive test load of some type to the power supply and watch the DC voltage and ripple with the oscilloscope to make sure the voltage doesn’t bog down and the ripple doesn’t being to get wild on you. 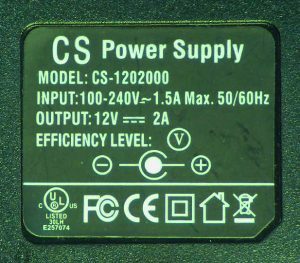 If the power supply passes this test, finish wiring it up and run the unit and the cameras off of your good, heavier duty, more reliable power supply and hopefully you’ll get more years of use out of your surveillance system. Let me rephrase that: hopefully it will actually survive beyond the warranty period and perhaps several years after that. I put it that way because every single system I’ve installed and maintained has started having problems before the warranty period ever expired. 73, and happy camera watching!